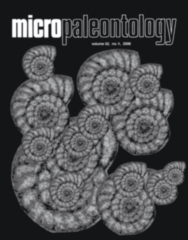 ABSTRACT: Radiolarians from the C. perneri-M. opimus graptolite Zone (Sheinwoodian; Wenlock) are described from a section in the Cape Phillips Formation, Nunavut, Canada, with a focus on the spherical radiolarian component (Archaeospicularia, Entactinaria, and Spumellaria). Three new genera, Involutentactinia, Perforentactinia, and Franklinia are described and the genera Labyrinthospahera, Gyrosphaera, and Haplotaeniatum are emended. Ten new species are described: Involutentactinia eccentra n. sp., containing two varieties; Involutentactinia eccentra n. sp. sensu strictu, and I. eccentra cupressa n. var. ; Magnentactinia ostentata n. sp., Perforentactinia excepta n. sp., Plussatispila aethra n. sp., Franklinia tricae n. sp., F. dipulvisphaera, n. sp., Haplotaeniatum vertigospongum, n. sp., Gyrosphaera cavea n. sp., Labyrinthosphaera lancia, n. sp., and Labyrinthosphaera ? lenzi n. sp. Haplotaenitaumiids and entactiniids are dominant and respectively, comprise as much as 35% and 20% percent of the fauna in some samples. Secuicollactines represent a small but persistent component. Inaniguttids, formerly thought to be a dominant portion of upper Sheinwoodian faunas, are represented by only one inaniguttid species, P. aethra, which makes up between 0.5 to 18% of the fauna. This first detailed glimpse at the upper Sheinwoodian revises the ranges of two biostratigraphically important taxa: the first appearance of Inanihella tarangulica group taxa occurs above the C. perneri-M. opimus Zone and the last appearance of Haplotaeniatum is within the C. perneri-M. opimusZone. Revisions to the existing radiolarian biozonation of Noble and Aitchison are proposed; the Long-spined inaniguttid 2 zone now extends through the C. perneri –M. opimus Zone encompassing this fauna, and the base of the Long-spined inaniguttid 3 Zone is redefined and moved to the base of the Homerian.